The Qatar Foundation International (QFI) presents itself as a friendly advocate for learning the Arabic language. But it is becoming ever clearer that QFI's deeper purpose is to advance the foreign-policy goals of the Qatari regime, which does not have American interests in mind. American educators can judiciously benefit from QFI's resources, but should beware of teacher training and student programs that contain Qatari propaganda. Recent news reports surrounding the dubious activities of murdered journalist Jamal Khashoggi have revealed the role in the sordid affair played by QFI, the American affiliate of Qatar's immensely powerful state-development apparatus, the Qatar Foundation. QFI's ostensible purpose is to provide educational resources and funding for the study of Arabic – which makes it all the more surprising that QFI director Maggie Salem was secretly ghostwriting articles for Khashoggi and encouraging him to take a hard anti-Saudi Arabia line. This sort of direct involvement in politics would seem out of step with the goals of a language-education foundation. QFI has gotten involved in politics before. Sometime before 2014, QFI sponsored the Arab American Association of New York, at a time when radical Islamist activist Linda Sarsour was its executive director. In July 2017, a month after Saudi Arabia and its allies severed political and economic ties with Qatar, QFI and the Qatari-regime-owned Al Jazeera jointly produced a propaganda video condemning the so-called "blockade." In November, QFI organized a panel discussion claiming that that the Gulf states' isolation of Qatar was due to "fake news," a claim that QFI's Maggie Salem explicitly endorsed on Twitter. In general, it seems that QFI often acts as an agent of influence for Qatar – which at a minimum should require it to register as a foreign agent under FARA, or risk criminal prosecution. But why? Why does a language-learning foundation keep popping up as a political actor? Educational nonprofits are no stranger to American politics, of course, but they usually don't agitate on behalf of foreign powers. Why would QFI keep taking such risks that seem outside of its mission? The mystery is cleared up once we realize that to Qatar, influencing American politics is the mission of QFI. Spreading Arabic-language instruction and training teachers across the country is meant to create a large pool of talented young Americans with favorable feelings toward Qatar, and the Islamic world more generally. 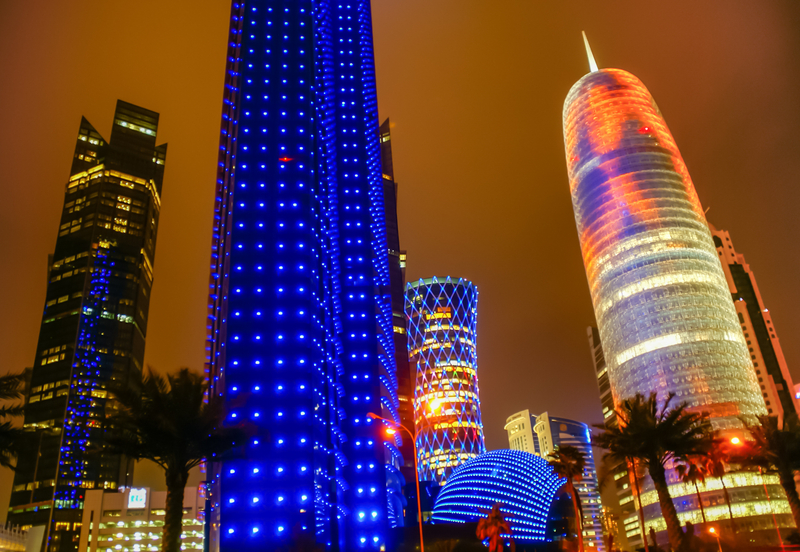 Even better, QFI's advanced learning programs allow it to groom a cadre of motivated activists, who can be harnessed to Qatar's larger goals. QFI does not merely assist in teaching Arabic, but evangelizes for it. Its affiliated website I Speak Arabic features an "Arabic Advocacy Kit," which includes not just resources for teaching Arabic and even founding new Arabic-language programs but an impassioned section about the many benefits of doing so. Explicitly stated among these is that learning Arabic will improve Americans' attitudes toward Arabs and Muslims, in addition to deepening their appreciation of Arabic culture. QFI directly funds Arabic classrooms across the country with tens of millions of dollars in grants. This money is a boon to cash-strapped language programs in poorer school districts like in Tucson, Arizona, or to elite academies seeking to beef up their offerings. QFI also provides scholarship opportunities and advanced classes involving travel to Qatar itself to promising students; however, one website claims that QFI program alumni, to be eligible for further grants and advanced programs, need to remain active on QFI's private YALLAH platform. YALLAH is used, at the very least, to coordinate global activism among its members; any other activity on YALLAH remains secret. Additionally, QFI spends tremendous resources to provide teacher training. It has partnered with some of the largest institutions in the educational world, including the Annenberg Foundation and the National Council for the Social Studies, as well as many smaller regional groups like the Green Bronx Machine or the Teacher Leadership Program hosted by U. of Texas at Austin. This is to say nothing of its growing collaborations abroad, such as with the British Council and the German-Arabic Freundschaftgesseleschaft. Unfortunately, we have already seen that along with the useful resources for teachers comes a heaping helping of Qatari propaganda. In the guise of educating teachers about the larger cultural context of the Arabic language, QFI presenters depict a version of Middle-East politics that is highly flattering to Qatar and critical of its enemies such as Saudi Arabia. Furthermore, QFI downplays the systematic support Qatar has provided to the Muslim Brotherhood, including funding actual terror operations. And this is why QFI's activities are so problematic. Increasing Arabic-language learning would be laudable in itself; more Americans ought to know Arabic, not least so that we can better understand what actually goes on in the Muslim world and not merely swallow the distorted pictures activists foist on us. Even using classroom time to deepen students' links with other countries need not be bad; cultural exchange can be a valuable part of learning. The problem is with Qatar specifically – a regime that promotes Islamist radicalism in order to increase its own power and influence in the Muslim world. Qatar's efforts to project cultural power – through QFI, though state-owned media company Al Jazeera, even through its corruption of international soccer (!) – are ultimately malignant because of the nature of what Qatar is promoting. And they will continue to be malignant until Qatar renounces its support for the Muslim Brotherhood and Islamist extremism. The American educational establishment has embraced QFI with open arms. This is a mistake. Teach and learn Arabic, to be sure; benefit from the resources QFI makes available, when they come with no strings attached. But teachers must beware of Qatari propaganda masquerading as education – and not allow such propaganda to infect American classrooms. Dr. Oren Litwin is a research fellow for Islamist Watch, a program of the Middle East Forum, and oversees its Islamist Money in Politics program.